Is your little girl already growing up to be quite the history buff, idolizing women like Betsy Ross, Phillis Wheatley, and Betty White? Or maybe she has a presentation coming up about one of these amazing gals and their accomplishments at school! 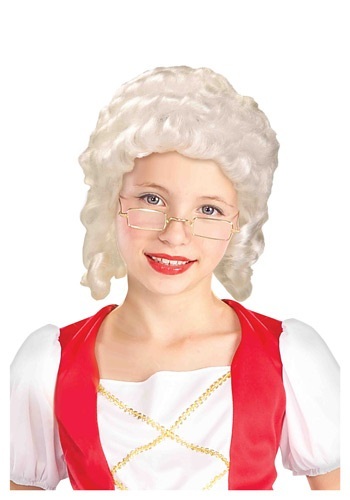 Well if she wants to portray a historic style for fun or if she needs to do so for a passing grade in history class this year, you can't go wrong with this Colonial Girl Wig! Why waste the time visiting antique shops or flipping through the yellow pages in search for an 18th-century hair stylist when we have this unique hair piece available right here! Once she is running around with this beautiful white wig on, all she will need to complete her historic transformation is a colonial styled dress along with a pair of bifocals. Then she will be ready to help teach all of her friends and classmates about the strong women that helped to build our country from the very beginning.